I have vague memories of an after school special called Stoned. Scott Baio played Jack Melon, a good doobie who dabbled in doobies and quickly saw his life take a dubious downturn. In one scene he’s rowing in a drug-induced haze while his brother swims nearby. After cracking him on the head with the oar his brother nearly drowns – lesson learned: rowing and drugs don’t mix. This movie made getting stoned look really silly and fun, especially with all the giggling and the munchies. The downside of using drugs and booze was so overplayed that it came off almost cartoon-like. I imagine if you were stoned or drunk watching this movie you would get a kick out of it. Jack had this cool little box on the bottom of his skateboard that he used to store his weed. I thought for a pothead it was pretty inventive. I expected a line of skateboard ‘trunks’ to result from Stoned, but they never caught on. I did a lot of skateboarding in those days and grinding or rail sliding hadn’t caught on yet. The style then was more old school, a laid-back carving style to which smoking weed is conducive and a skateboard trunk doesn’t get in the way. 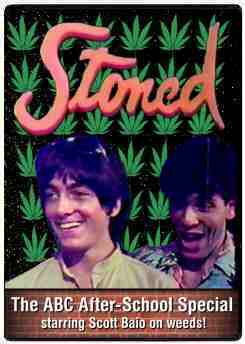 I found this movie for sale in only one place, Google the words “STONED DVD 1980 TV movie Scott Baio.” A little off-topic yes, but I can’t pass up the opportunity to share a memory of an after school special, especially one as classic as Stoned.